Once you've completed the steps in Show a public calendar on my website, you're ready to share a public calendar on your website. If you haven't copied your source calendar's iCal URL, as explained that article, you'll need to do that first. Click Calendar in the right panel. Click a layout in the Calendar panel. 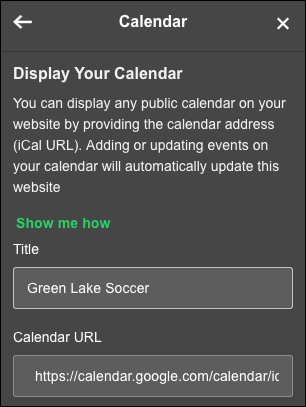 When an Events placeholder calendar appears on your page, click Events in the right panel. Copy the iCal URL you saved from your source calendar and paste it into the Calendar URL field. Note: If you see "Calendar synced! But no event found in current calendar," it means that GoCentral didn't find any upcoming events in your calendar to show on your website. Note: To delete a calendar, click Remove Section at bottom of the right panel.